At the end of their current fiscal year (6/30/08), Bill Gates is scheduled to turn the Microsoft keys over to Ballmer, Ozzie & Co. while he focuses on other endeavors. That's a pretty significant step for such a giant of technology, so what does the future hold for the folks in Redmond? Other than Microsoft's own high-ranking executives, Mary Jo Foley is probably the most highly qualified person to answer that question; her All about Microsoft blog is closely watched by analysts, skeptics, fans and Microsoft insiders around the globe. Fortunately for us, Mary Jo is putting her thoughts into a new book that will be published by our group here at Wiley next Spring. 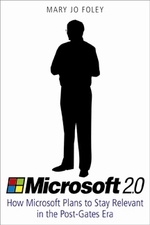 You can read more about Microsoft 2.0: How Microsoft Plans to Stay Relevant in the Post-Gates Era in this announcement which Mary Jo posted on her blog earlier today. While it's a bit disappointing to see that The Wall Street Journal might abandon their online subscription model, it's not exactly surprising. The kicker is that wsj.com is often referred to as "evidence that a paid online content model can work", so why abandon it? Reach and growth, for starters. Like so many other content businesses these days, I've got to believe the WSJ is struggling to attract younger customers. Any recent college graduate has more or less been raised with the assumption that plenty of free content is readily available, so why pay? Let's not forget that the WSJ also caters to a professional readership, many of which rely on the paper's content for their day-to-day jobs. This customer segment would likely pay much more than $99/year for online access to the Journal (especially since their company pays for it, not the individual), but the more they exceed a $99/year price tag the less likely they are to lure in a broader, less professional audience, hence the dilemma. On the surface, I think Murdoch's plan to make the Journal free online is pretty darned smart. Parts of the Journal are freely accessible today anyway so what's the harm in making the whole paper free? Are they worried about the loss of the $99/year they're getting from all those professionals today? Set it up so that today's paper is free and searches back a week are also free, but searches further back require a...wait for it...paid subscription! That's right. They'd still be able to get $99/year from all those professionals who need archive access to do their jobs. Heck, you might even convert a non-paying customer or two into subscribers if they find enough value in the archives. What's not to like?! Smart move by The Economist. They're working to leverage the blogosphere by providing early access to content. The goal is to generate buzz about upcoming content before it appears in their magazine or on their website. Smart, but tricky. The key to success here will be to see whether they can truly engage the blogosphere rather than appearing to simply use it. That probably means dedicating resources to work with each blogger and not just doing mass e-mailings of pre-pub information every month. Will they make it easy for the bloggers to interact directly with writers, editors and others associated with each article? This will be crucial if they expect the bloggers to spark discussion about this material. Few of these high profile bloggers will be patient enough to wait for answers back from a "PR spokesperson" or anyone other than the person who wrote or edited the material; they'll expect the same sort of transparency from The Economist that they're trying to promote through their blogs. Again, provided The Economist is approaching it with the appropriate level of attention and investment, I think it's a fantastic idea and I look forward to reading more about the results in the future. Book authors: There's a tip in this for you as well. It's always a great idea to see if you can leverage the blogoshpere for your upcoming book. Work with your editor/publisher to see whether they'll help you (or at least support you!) by providing final, edited chapters or other excerpts for this sort of thing. Newspapers continue to see subscriber and advertising bases shrink but some are experimenting with news content distribution models. This AP story was picked up by my local paper (The Indianapolis Star) today and is evidence that The New York Times, The Wall Street Journal and The Washington Post are just three examples of papers that "get it" when it comes to widgets. A critic could argue that there's no clear way to monetize this sort of model. The optimist in me sees that these papers aren't content to sit on the sidelines and watch as their brands become even more marginalized. So what if they can't make money right away? As the article notes, at least they're getting their content in front of a much younger crowd, often the audience segment they're least likely to reach in print. I mentioned John Moore's Tribal Knowledge book in an earlier post as a great example of how to build an effective companion website. I finished reading the book last night and give it high marks for being full of valuable information. Each chapter is very short and focuses on one particular lesson learned from Moore's years as a marketer with Starbucks. Unlike that other Starbucks book I read and reviewed earlier this year, this one reads much more like an unauthorized account as opposed to "official corporate policy." If you freed up advertising dollars to be spent elsewhere within your marketing budget, how best would you allocate the money to focus more on being and doing rather than saying? He also explains how Starbucks continues to challenge itself. Rather than being content as the leading coffee shop chain, they look at "making the transition from Starbucks as coffee 'brand' to Starbucks as beverage 'icon'." So instead of owning the majority market share in the coffee world, they prefer to look at themselves as "an upstart, competing against the old-school beverage icons like Coke and Pepsi." Moore gives great insight to the human side of Starbucks and what characteristics are common in the best employees. He also talks a bit about why employees leave. As he puts it, "people quit people, not companies. It's the person on the ground, not the board of directors on the eighth floor of corporate headquarters, who represents the company to your employees." How true. 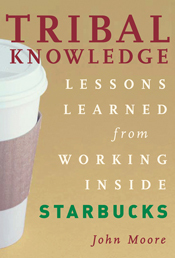 If you're looking to get the inside scoop on what makes Starbucks special, this is the book to read. But I'd also recommend it to anyone who wants to learn countless bits of wisdom that can be applied to just about any business.